I will never be able to beat this guy." Two years after the highly successful and critically acclaimed book Agitator: The Cinema of Takashi Miike, author Tom Mes sheds his light on one of the most important and influential filmmakers to emerge from Japan in the past twenty years: Shinya Tsukamoto. Unleashed with the now legendary black and white cyberpunk masterpiece Tetsuo: The Iron Man, Shinya Tsukamoto is truly one of Japan's leading filmmakers. With visual assaults like Tetsuo II: The Body Hammer, Tokyo Fist and Bullet Ballet he has gained a worldwide following and paved the way for the international breakthrough of Japanese cinema. Despite his fame Tsukamoto remains fiercely independent, financing, writing, shooting, directing and often also starring in his own films. Shinya Tsukamoto is literally uncompromising. Fully authorised by the director and featuring first-hand accounts from many of his close collaborators, the brand new book Iron Man: The Cinema of Shinya Tsukamoto is a fascinating and in-depth look at the life and work of an intense, groundbreaking filmmaker who counts Quentin Tarantino, Tsui Hark, cyberpunk novelist William Gibson and Matrix directors The Wachowskis among his most loyal fans. With many of his films now being released on DVD (including Tetsuo I & II, Bullet Ballet, Hiruko the Goblin, Tokyo Fist and Gemini), and his latest masterpiece Vital ready to hit cinema screens, 2005 promises to be the year of Shinya Tsukamoto! Don't miss out. 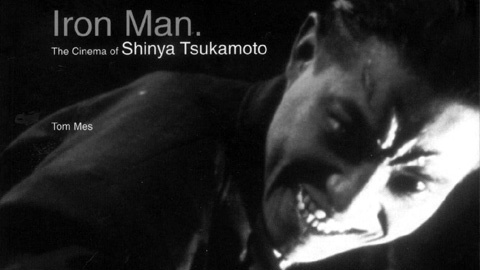 Iron Man: The Cinema of Shinya Tsukamoto is your guide to the nightmarish, chaotic, and hauntingly beautiful universe of one of the leading figures in world cinema. 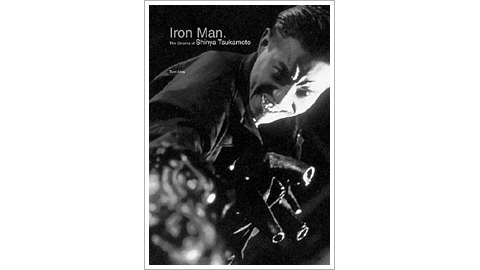 Iron Man: The Cinema of Shinya Tsukamoto is available now from FAB Press in both paperback and hardcover editions. Why did you decide to write this book? And why now? I was actually quite surprised that no one had ever done a book about Tsukamoto before. He's been around for so long and has such a strong international following, especially among sci-fi and horror fans, that he seemed one of the most obvious candidates for book treatment. My second book The Midnight Eye Guide to New Japanese Film, which I co-wrote with Jasper Sharp, includes a chapter on Tsukamoto. For that I revisited all his films and was blown away by them all over again. They still had the same power as when I first saw them a decade earlier. This really gave me the incentive to start digging deeper and I came up with the idea of doing a full book. Someone of his stature certainly deserves one, and since Tsukamoto only made eight films in the last fifteen years, all of which were easy to get hold of, the job certainly seemed manageable enough. What's the approach you've taken in the book? My book on Takashi Miike was largely analytical, which was very intentional. I felt that the discussion about him was becoming stagnant, so I wanted force a wedge into it by introducing a radically new point of view. But since every director is different, they all require a different critical approach. Tsukamoto is a real independent filmmaker, in the purest sense of the word: he finds funding by himself and produces his own films from his own scripts, with no outside interference. I felt it was very important to show the kind of context someone like that has to work in, how he can survive as an independent filmmaker. And he pretty much refuses to work as director-for-hire, he's very maverick and has been working the same way for his entire career. So that aspect of him was something I wanted to try and express too. As a result, the book became more about the background and production circumstances of his films, and it ended up a lot less focused on analysis. How would you explain what sort of filmmaker he is? If you were to put David Cronenberg and Ridley Scott in his Alien/Blade Runner period in a blender, let the results simmer on Tokyo asphalt, and raise it on an exclusive diet of Japanese monster movies, you would get something resembling Shinya Tsukamoto. What are the defining themes in his films? He's often described as being heavily influenced by Cronenberg and Lynch, but how does his approach differ? The Lynch comparison came about as a result of his first film Tetsuo: The Iron Man, which had a similar black-and-white, low-budget, industrial-surrealist feel to it. So the comparison is more the result of the ambiance of their films than of any direct influence. Eraserhead was a handy reference for people trying to make some sense of Tetsuo. Cronenberg on the other hand is a favourite of Tsukamoto's and you can see a lot of similarities between them, particularly in their fascination with the fusion of flesh and metal. But Tsukamoto works from a very Japanese context, so he talks a lot about the negative side effects of life in the metropolis of Tokyo. He sees city life, working office jobs all day, and spending hours commuting on overcrowded trains as numbing the senses and robbing people of their humanity. In his films he wants to wake up his countrymen in the most extreme ways possible. How is Tsukamoto received in Japan compared to North America and Europe? I've heard he's more celebrated over here. He has a core base of fans in all those parts of the world, but even though he was very important for the international renown of Japanese movies, he is still seen as a kind of outsider at home. But it's true that he's gained more acclaim and won more prizes in North America and Europe than in Japan. Maybe it's because his work was quite close to what was happening in American sci-fi and horror in the 1980s and 90s that he was so quickly embraced by North American and European audiences. "Tom Mes is a welcome beacon of sanity. He provocatively argues that Tsukamoto is one of Japan's truly original film-makers. A respectful, honest account that will make Tsukamoto the envy of every other Japanese director." Shinya Tsukamoto's youth in 1960s Tokyo, steeped in pop culture, anime, monster movies and ghost stories. Plus his first attempts at filmmaking with his father's 8mm camera. In a hand-made tent in the shape of a sea monster, Tsukamoto and his Kaiju Theater company performed their underground plays all over Tokyo. A close-up look at his much talked-about, but little seen short films The Phantom of Regular Size and The Adventure of Denchu Kozo. On Tsukamoto's work as an actor, in films by Takashi Miike, Takashi Shimizu, Teruo Ishii and others. A complete filmography, including all his early 8mm works, theater plays, feature films and acting appearances. With cast and crew details, Japanese titles (with kanji), running times, tech specs and more. Detailed information on all existing DVD releases of Tsukamoto's films, with info on region coding, subtitles, extra features, etc.